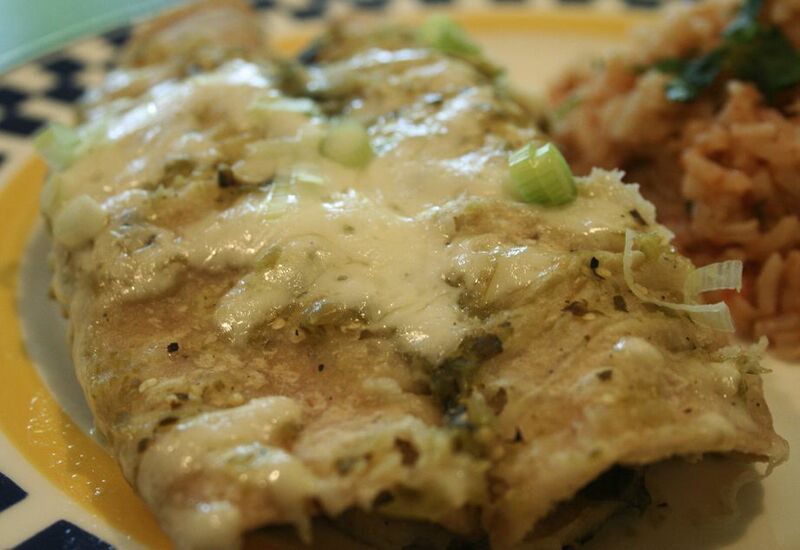 While you can't see the filling in these yummy enchiladas, trust me, they'll be a huge hit! I usually make them in the summer when I have several ears of roasted corn leftover from a BBQ, but they work just fine with "regular" corn (canned or frozen) too. The recipe looks lengthy, but it's actually really easy, they go together fast and are a great way to use up leftovers! Sweet potatoes seem to be popular in enchiladas these days, but this recipe uses plain old white potatoes - usually my leftover breakfast homefries. You can also make these "red" or "green", depending on what type enchilada sauce you prefer. Enjoy. 3/4 cup soy or whatever milk. Grease a 9x13 inch baking dish with vegetable oil spray. Add black beans and "mash" beans into potatoes a bit (I use a potato masher) until beans just start to break apart, incorporate with potatoes and get sticky. Add taco seasonings and 1 CUP of the salsa. Stir together until heated. Remove from heat. Prepare tortillas: Place a small skillet over medium heat, and add a bit of oil. One at a time, heat tortillas in skillet until pliable, turning with tongs several times if needed. Stack on a plate and cover with damp towel. I do half and then fill them. Then do the other half. Mix sauce: Mix remainder 1 CUP salsa, enchilada sauce and soy milk to make a sauce. Fill tortillas:Place a heaping spoonful of the potato and bean mixture onto each tortilla. Roll up tortillas and place them seam side down in the prepared baking dish. When all tortillas are filled, spoon sauce over the rolled tortillas, spreading to cover all the tortillas even if it's a thin layer. Bake for 20 minutes covered with foil, then uncover and bake another 10 min. Remove from the oven, and sprinkle 'cheese' over the top. Return to the oven for 10 minutes, or until 'cheese' is melted and bubbly. Garnish with chopped green onions or chopped black olives if desired. Holy moly! Ok, I am making these tomorrow! Gosh they look so good and I love everything in them....thank you again for a super recipe! Did I tell you I am going to New Mexico in 2 weeks? I can't wait! Had to let you know; They were awesome! Have you ever sat at a meal where everyone there was so enraptured with the food, there was no talking? These were just that good-the best enchiladas I have ever made. Period. The seasonings were spot on, and the end result was moist and tender with the Daiya giving that lovely stretchy melty gooey thing we so enjoy. Tofu mom, you've done it again. Absolutely perfect. Thanks Marti am making these today. I can tell they are going to be good I just tasted the filling. Lovely!